A prisoner who reported hearing a cell confession by Michael Stone was so upset at the details that he needed psychiatric care, judges have heard. 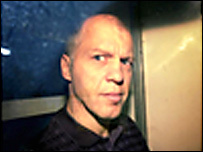 Stone is appealing against his conviction for the murders of Lin and Megan Russell and the attempted murder of Josie Russell in Kent in 1996. Stone allegedly confessed to Damien Daley, an inmate in Canterbury prison. Stone's lawyers say he was convicted on the evidence of an unreliable witness seeking an advantage from the police. On Tuesday, London's Appeal Court heard Daley needed medical help after the confession, and sleeping tablets. QC for the crown, Nigel Sweeney, said Daley was seen by a psychiatric nurse and took sleeping tablets for three nights afterwards. The lawyer also said the defence was relying on the fact that Daley had lied about his heroin addiction at Stone's trial. He said Daley had nothing to gain by lying about the confession. During Stone's second trial, Daley had told the jury he heard a voice coming through the pipework at Canterbury prison, confessing to the killings. Representing Stone, Edward Fitzgerald QC, had said the convictions should be quashed because Daley lied about his drug habit. But Mr Sweeney said: "Had the position been that Mr Daley was put forward as a man of good character that would be one thing. "However the position in relation to Mr Daley was that he accepted that he was an individual who would lie when it suited him, that he was a character with previous convictions, and he had tried or taken every drug that it was possible to take." He said Daley had "already made very substantial admissions as to his own failures". Stone, who was given three life sentences, always denied the attacks. Dr Russell, 45, and her daughters were attacked by a man wielding a hammer as they walked home from a swimming gala. Josie, who now lives with her father in North Wales, survived the attack, but suffered severe head injuries and brain damage. She was nine at the time of the attack. Stone was first convicted in 1998, but appeal judges quashed that conviction and ordered a retrial in 2001. That year, Stone was convicted for a second time after the retrial in which Daley gave evidence. In 2004, lawyers argued that Stone had not received a fair trial and won the right to a second appeal.